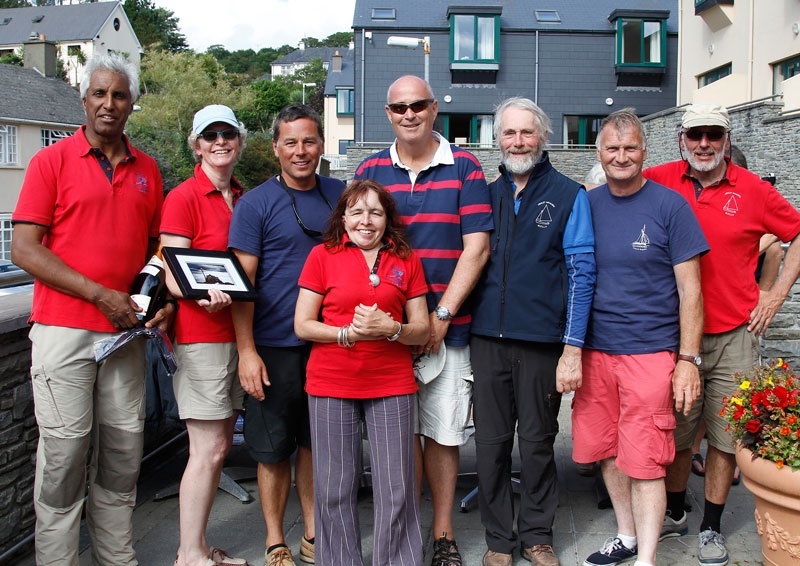 A great, week-long, harbour and coastal regatta in craggy scenery. Plus Irish hospitality! Based in South-West Ireland, The Classics Regatta is held in July of alternate (odd) years. 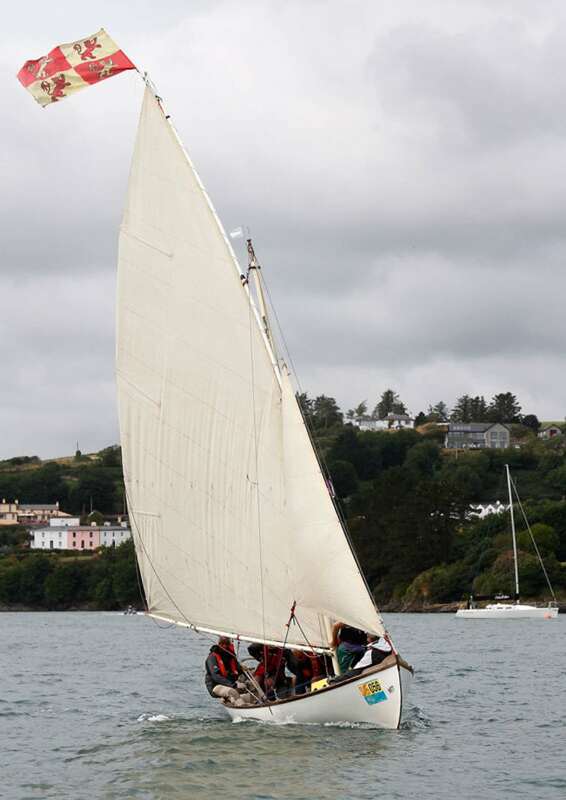 The Next Glandore Classic Regatta = Saturday 18th to Friday 24th July 2015. 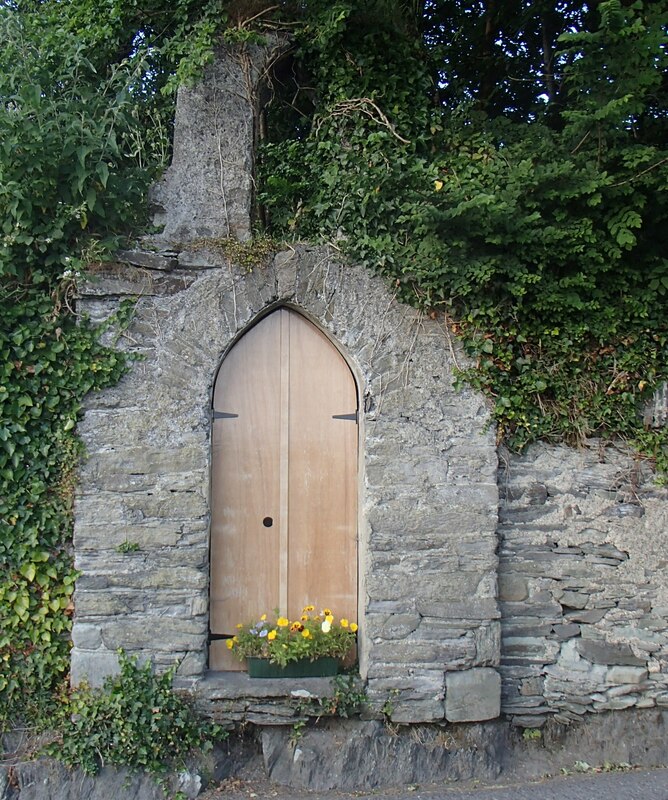 The small village of Glandore lies some 50 miles southwest of Cork, and 150 miles (say three and a half hours) by road from Rosslare. The Marine Hotel overlooks the tiny, semi-drying inner harbour which is sheltered by a stone wall. The slipway is suitable only for small hand-launched dinghies. Up the street, on The Terrace, and commanding a broader view across the entire harbour, are The Glandore Inn and Hayes Bar. Across Glandore harbour lies the small town of Unionhall with shops, more bars, restaurants, the fishing harbour and a good slipway. Saturday 20th July – The overnight ferry crossed a dead flat Irish Sea and arrived at Rosslare at 06:15. Henley Whalers had feasted on a generous on-board dinner and grabbed a few hours' sleep. 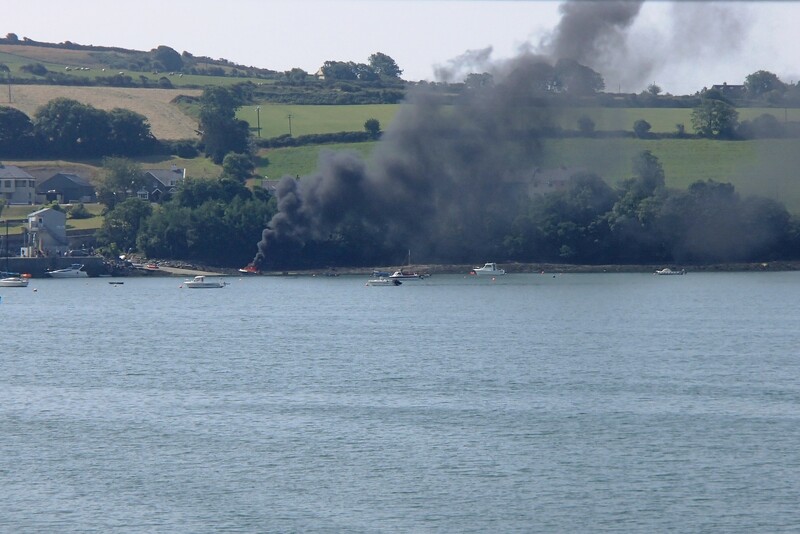 At about 10:30, crossing Glandore Bridge to Unionhall where Molly would be launched, an ominous pall of thick black smoke was seen rising from Unionhall slipway. Was it a boat on fire? . . . . About an hour later, the pyro-excitement over, launching was easy and was followed by a pleasant sail across the harbour to Glandore village to register and find Molly’s berth. Around 60 boats were entered for the racing events. In the afternoon, Molly, in the "Day Boats and Miscellaneous" class, enjoyed racing in the Harbour amongst Dragons and Squibs. Saturday's results did not count towards the Classic series. In the evening we were treated to a rescue display with flares and smoke. Hmm - Pretty hot boat! Sunday 21st July - Only one Harbour race today. Molly crew had lots of fun but finished in a poor position. The main event was the Parade of Sail, led by the Regatta’s VIP boat “Jolie Brise”. This was a great chance to review the entire fleet and was rated a spectacular success by the organisers. In late afternoon, Molly crew retired “home” to refresh, then gathered in Unionhall village for dinner and festivities. The Unionhall festival, about to be officially opened by Jeremy Irons, was in full swing. With Henley as common ground (and identified by Henley Whalers’ iconic crew kit) Jeremy joined the Whalers for a while to reminisce about Henley. After dusk, The Whalers walked past the fishing harbour to watch the Glandore fireworks display across the bay. A chance encounter led to an invitation to a splendid view from the terrace garden of a well placed house. Monday 22nd July - Drizzle at dawn. Dry but overcast later. This was the first official day of racing for the Classic Series. Class 1,2 & 3 boats sailed out into the bay with a shortened course that then allowed the entrants to progress to Baltimore. Harbour racing continued for other classes. Molly Crew thought they’d done well in two races, so were mystified at not getting a mention in the results. Never mind; ‘twas fun. Tuesday 23rd July - Woke to rain. After breakfast it rained, then it rained. In the morning, Claus kindly drove the "Mollys" to Baltimore where the sun shone briefly whilst they took a walk on a headland. Rain returned during the drive back to Glandore. Afternoon – More harbour racing – raining at the start, dry toward the end. Molly won the 1st & 2nd races. The sun emerged later. Boats that had stayed in Baltimore overnight sailed to the Fastnet, and then returned to Glandore. "Mollys" bought fresh fish in Unionhall to BBQ at “home”. Aimed to return to Glandore for the prize-giving later. You got any contributions? - Please send them. Wednesday 24th July - Guess what? Rain at breakfast time. Eventually stopped but remained grey and windy. Too windy for the sail to Castletownshend – This was postponed, so more harbour racing today. "Mollys" enjoyed 2 good races despite some heavy (warm) rain. Alternate rain and sun became the pattern for the day. Was this one of the evenings we dined at the Leap Inn? Thursday 25th July - Sunny at dawn and almost all day - Just one nearly imperceptible brief shower. Lovely sail west along the rocky coast to Castletownshend for lunch. Glorious weather and conditions both ways. Friday 26th July - Last day of the Regatta - Lovely, sunny sailing in the harbour. "Mollys" think they’ve won an overall prize – Find out tonight at the prize-giving. Sailed Molly to Unionhall slipway for recovery to trailer. The Grand Prize-giving took place on the terrace at “The Marine”. Result - Day Boats & Misc. Morning - Found time to visit the ancient Drombeg stone circle, one of the most visited megalithic sites in Ireland, then returned to Unionhall for a final look around before collecting Molly. At 13:15 left Unionhall, Molly in tow, heading for Rosslare/Fishguard ferry by way of meeting up with another event, and friends. Sunday 28th - Land at Fishguard at 00:15. Home about 6:30. See also; Daily Diary , GHYC website.